So I decided that my collection of Pixar soundtracks was worthy of a post since it's technically a big part of my collection, even though they're just digital files and not tangible items. I'm lucky enough to have the very rare "complete scores" for each film (except the original Toy Story and Cars since, from my knowledge, complete scores for these haven't been made) and even some soundtracks for short films that have been released (such as The Blue Umbrella-full post here, Day & Night, La Luna and Luxo Jr.). The music in Pixar films, to me, is such a huge part of what makes them so special. Each film has instantly recognizable themes and cues where you can hear just a few seconds of it and know exactly what film the song is from. The scores and songs add tremendous heart to the already incredible, heartfelt stories. Each soundtrack is beautiful, iconic, and memorable thanks to the 4 genius composers (Randy Newman, Thomas Newman, Michael Giacchino and Patrick Doyle) that have been involved with the 14 feature films and the many great composers that have contributed to the magic of the short films as well. Imagine Wall-E and Eve's beautiful dance in space without the score or the Toy Story trilogy without "You've Got a Friend in Me." Think of the beginning montage in Up, the incredible action scenes in The Incredibles, Sulley's emotional goodbye to Boo in Monsters Inc. or Jessie's story in Toy Story 2, all without music. Not as powerful, right? As powerful as the images are on screen, it's really the music that brings all the emotion of these films full circle. As much as I love all of the composers involved, as each has brought something new and amazing to the Pixar table, I would have to say Randy Newman's scores are my all time favorite. I really look forward to when he is slated to compose a Pixar film. Starting with Toy Story, he really set the tone, feel and standard for every Pixar film that followed. He truly has a unique style and sound to his music that I have never heard in any other composer. As far as my all time favorite Pixar soundtrack? Oh man, I don't think I could choose. I guess if I had to though, I would say Toy Story for similar reasons as to why Randy Newman is my favorite of the composers (and because of the pure nostalgia I get when I hear the music). I remember how much I loved the soundtrack when seeing the movie (I was only 5) and got the soundtrack on cassette tape soon after (and I remember playing it all the time on my Mr. Mike tape player/recorder). To see an amazing tribute to the 4 main Pixar composers, check out this video of the Pixar in Concert finale that I recorded when I saw the show back in January. What is your favorite Pixar soundtrack? Who is your favorite Pixar composer? I would love to hear your thoughts in the comments below! Thanks so much for stopping by my blog today and be sure to check back daily for more. Have a great weekend! 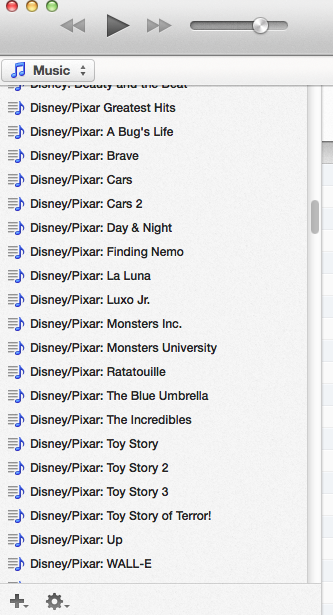 How can I decide who my favorite Pixar composer is? I would say it's a tie for me between Michael Giacchino and Thomas Newman...what? No Randy Newman for me? Nope! I do love Randy's work (don't get me wrong), but I have to say that I really connect with the power and feel of Michael Giacchino's work and the emotional side of Thomas Newman's work. But what good is asking a question if you can't answer it straight...so if I had to pick, I'd have to say Michael Giacchino's work would be my favorite. The reason is because the moods that he created for The Incredibles, La Luna and Ratatouille are really amazing to me. In a way, I guess I think it's really hard because you have to make the scores "original sounding" but still have elements of spy movies or French culture (in the case of The Incredibles and Ratatouille), whereas Thomas Newman had more freedom to create an open and ethereal sound for his underwater composition (Finding Nemo) and his space exploration file (WALL•E). Again, I hate to not say Thomas Newman as well because some of his tracks are the most powerful and emotional of the complete Pixar catalog, but Giacchino has been given more opportunities to win me over (since he's done more films than Thomas).